into your bookmarks bar—you can change the name to whatever you like. If you follow @DrSamuelJohnson, clicking the bookmarklet when you’re at twitter.com will change the font of his posts. You don’t need to have IM Fell English on your computer; it’s downloaded as part of the page, just like a photo or screenshot. Pretty simple. The first line sticks a link to the webfont into the <head> of the page. The second line grabs all the @DrSamuelJohnson tweets (list items assigned the u-DrSamuelJohnson class) and changes the font. Only the tweet text itself is changed; the meta information is left alone. 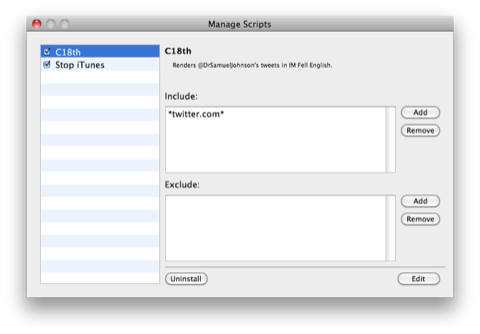 The bookmarklet uses jQuery, but there’s no need to link to the jQuery library, as Twitter already uses it. It would be easy to extend the bookmarklet to change the fonts of anybody. If you follow me, please don’t change my tweets to Comic Sans; my feelings are easily hurt. 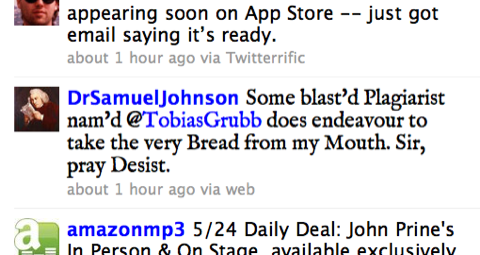 // @description   Renders @DrSamuelJohnson's tweets in IM Fell English. If you have GreaseKit installed for Safari, click this link to install and activate the userscript. I have it set up to work only with sites that have “twitter.com” in their URL. This should work for Firefox/Greasemonkey, too, but it doesn’t. In fact, even the simple bookmarklet doesn’t work for me in Firefox. I don’t know why, and since I don’t use Firefox I don’t care enough to pursue it. If you know the answer, tell me in the comments or an email.